Report of the Save the Tigris Campaign Strategy Meeting (Extract). 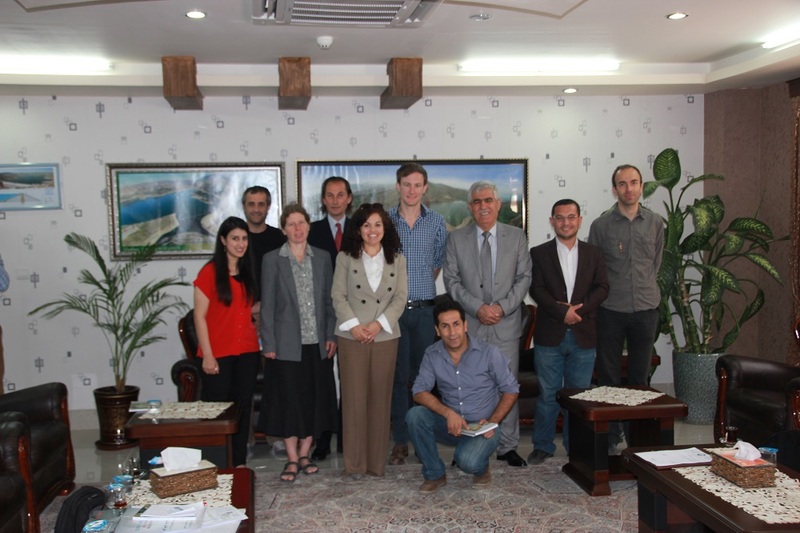 More than 20 participants, international and from all over Iraq gathered in Erbil, Iraq, from 9-12 May for the Save the Tigris Campaign’s strategy meeting. It was an important event, since for the first time in the history of the campaign all activists, from in – and outside of Iraq, gathered together during the actual strategy meeting on 10 May. For some of us it was the first time to meet face-to-face with other activists in the campaign. In that regard, the event was a success since activists were able to discuss the campaign with each other in person. The intention was to set up a strategy for the next 1.5 years. The strategy meeting was followed by advocacy meetings on 11 May with the General Directorate of Dams and Water Reservoirs (see picture), the Water and Agriculture Committee in the Kurdish Parliament and a general meeting with local NGOs, in Erbil. On 12 May a press conference took place where the campaign released a statement. To follow-up, active participants of the campaign will become members of the Steering Committee, which is the decision making body, especially since each partner is working within separate spaces (Iraq, KRG and internationally). We need strong communication on a horizontal level between the international partners, KRG and Iraq (and within Iraq different regions: Baghdad/Basra). On a vertical level, we need to ensure communication from the Steering Committee to our official partners on the ground and in their turn to their collaborators (researcher, volunteers, activists, other organizations). Our current partner in the KRG is the NGO Al-Messala, and there is a timeline for our activities in the KRG. In the rest of Iraq we have several organizations who intend to work on the campaign, with the ISF being the main partner, and the activities being executed by Information Center (based in Baghdad). A long-term commitment is required of various partners in the south. The Steering Committee will meet on a frequent basis via Skype to discuss the direction of the campaign. Regarding visibility: it is important for the campaign to establish a nation-wide presence with a strong presence in the political centers where our advocacy work is mostly needed. To this aim we will expand our team of volunteers, and we have a large stack of banners, posters in the KRG. The plan is for the rest of Iraq to have the same. Our media activities need to be strengthened, although we are on the right track. Together with our partners, we are increasing our presence on Facebook, having doubled our number of likes on Facebook in the past weeks. We introduced a new hash tag (#Save_Tigris) on Twitter and we plan to publish more videos on our Youtube channel. Several activists from the campaign have voiced their opinion that it is important for the campaign to keep an activist approach, and for the next period to mostly focus on advocacy and not on awareness. A lot will have to be invested in our relationship with the authorities in the KRG and especially in Baghdad. It is very important since our advocacy is targeting the government institutions. We must not lose focus of our main goal, which is to advocate with the authorities against Ilisu and other dams. Plans should be made and activities should take place with this ultimate goal in mind: what does it contribute to our advocacy targeting authorities in the KRG and Iraq? This is especially relevant for the research on dams, which in the end should produce a document that is able to convey the message to authorities and local communities that Ilisu and other dams pose a great threat to Iraq and the KRG. The Euphrates in Crisis: Channels of Cooperation for a Threatened RiverSave the Tigris Campaign workshop in Erbil upcoming!